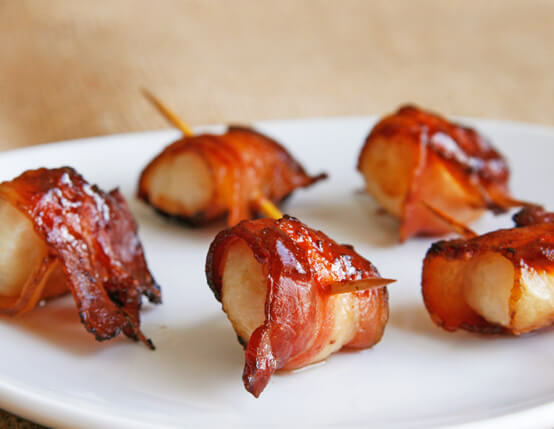 Sometimes the easiest appetizer recipes are the most popular--and this bacon-wrapped water chestnut recipe is no exception. *Or use your favorite Paleo BBQ sauce! Wrap whole water chestnuts in Jones bacon and secure with toothpick. Place on baking sheet and bake in preheated 375°F oven about 20 minutes until bacon is crisp. Brush with your choice of BBQ sauce or homemade glaze. To make homemade glaze bring soy sauce and brown sugar to a boil. Drizzle over cooked chestnuts. 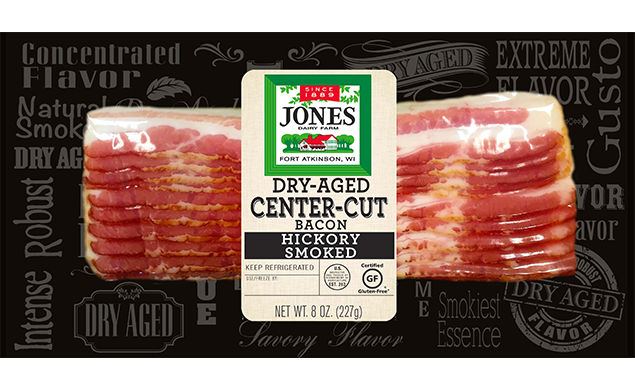 2 cans whole water chestnuts, drained 16 slices Jones Dairy Farm Dry Aged Bacon Prepared barbecue sauce or homemade glaze (see below) *Or use your favorite Paleo BBQ sauce! Mom has used this recipe for years. Whole water chestnuts can be a bit large, cut the larger ones in half. Also, soak the water chestnuts in the soy/brown sugar glaze overnight before wrapping them in bacon.